Can Stormont survive its 'GUBU' moment? A PERIOD of grave political controversy in Dublin in the 1980s was famously described as "Grotesque, Unbelievable, Bizarre and Unprecedented". The acronym 'GUBU' became a label for hyper-dysfunctional politics. So it was fitting that the news of Peter Robinson’s unconventional plan to buy time at Stormont was first leaked into the public domain via the Taoiseach Enda Kenny’s Fine Gael party in Dublin. 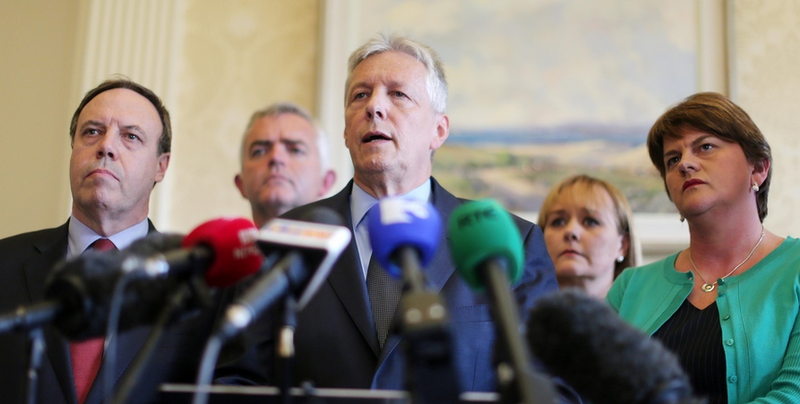 Most observers at Stormont refused to believe it until Peter Robinson confirmed it himself. The DUP is still struggling to explain its U-turn after the party leader pledged to deliver “DUP Ministerial resignations” and to "take the final step". His last gasp 'Plan B' was to remove several ministers, but retain Arlene Foster as Finance Minister and acting-First Minister, while he remained in a semi-detached role. Even by Stormont's standards, it was an incredible twist. While not grotesque, it was certainly unbelievable, bizarre and unprecedented - a 'GUBU' moment for Belfast politics. Peter Robinson is contorting himself and his party to avoid Stormont's certain collapse and to buy political time. But why? By this stage it is being occasionally forgotten that the latest phase of crisis first began when police implicated IRA members in the murder of Belfast republican Kevin McGuigan, following the murder of former IRA member Gerard Davison. The additional police assessment that the wider republican movement was committed to peace did not prevent the UUP's decision to pull out of the Executive, and then to withdraw from the subsequent political talks, which meant the DUP was outflanked twice. The DUP leadership had to react to the police statements, but it is believed it did not want to be seen to follow in the wake of Ulster Unionist leader Mike Nesbitt, or to leave the DUP carrying the can for collapsing devolution. So, as the controversy grew, Peter Robinson demanded either an adjournment of the Assembly by Stormont parties, or its official suspension by the Westminster government. He got neither. He was faced with collapsing the institutions and forcing an election under unfavourable circumstances, or finding a way to make a strategic retreat. Speculation is rife over the reasons for his surprise move. Was it concern that a collapsed Assembly might remain lost for a decade? Does his party want time to position itself ahead of an election, given that one is due in May anyway? Perhaps the DUP wanted the circumstances of any collapse to be clearly blamed on Sinn Féin, given the IRA backdrop to the latest crisis? Or maybe the party simply expected an adjournment or suspension would emerge to delay events? A further, very prominent theory is that this is linked to Peter Robinson's legacy, his likely retirement, and the practicalities of organising a handover of power. It’s the morning after the night before, and the DUP has tumbled straight into another row. Arlene Foster – who is now acting-First Minister and the politician tipped to be Robinson’s long-term successor at Stormont - is being criticised for claiming she is remaining in government to be “gatekeeper” against potentially “rogue” or “renegade” nationalist ministers making decisions that might “damage Northern Ireland”. The DUP claims it is guarding against a repeat of the scenario where Martin McGuinness scrapped the 11-plus school transfer test in the final hours of government in 2002. The rules around decision making have been altered since then, but if that was the DUP's point, critics say it could have been raised without name-calling across the political divide. It’s a sign that the DUP feels the need to provide a rationale for its manoeuvring and to shore itself up against its electoral opponents, but others are asking what it says about the future of power-sharing. The row has distracted from those benevolent voices prepared to argue that, for all his contortions, Peter Robinson may have done some service for the political process by buying time. The British and Irish governments now face a political landscape littered with wreckage: the IRA controversy, a 'zombie' Assembly, the potentially seismic split on welfare reform, and the ongoing public concern over the Nama controversy, plus looming elections at Stormont and the Dáil. Peter Robinson has, for whatever reason, created a window for the political process. There will now be an attempt to begin talks. The stop-gap engineered by the DUP might yet deliver a deal, or mark the beginning of the end. All this, after two murders, plus wider paramilitary activity, and to save an Assembly that is best known for its litany of failures and its inability to legislate for an increasingly diverse society. What a mess. Truly GUBU.